I take a picture of the box and put it in front of my beginning algebra classes the next day — today. 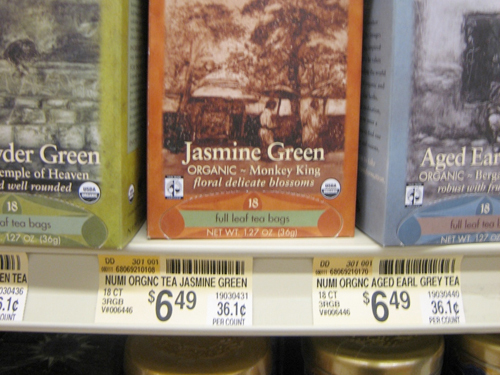 This is how we introduce rates: how it doesn’t just matter that the box costs more or that you get more tea in it rather you must consider the two things against each other. After we divide price by bags and come up with 36 cents per bag, the students notice that same figure on the price tag. 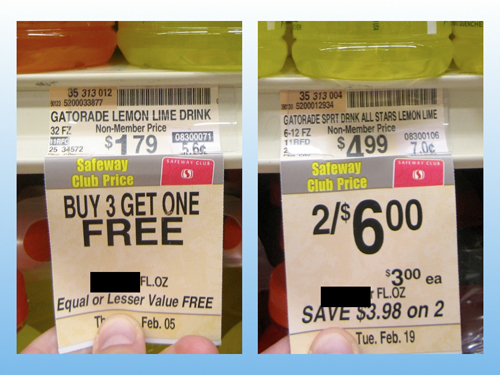 The grocery store helpfully makes these calculations for you. So when I put up two more photos, two sports drinks, one in bulk, the other in miniature six-pack, I censor those figuresIn this particularly mind-blowing example, the cost per ounce was the same..
And we spend 45 minutes running computations, discussing the results, arguing over the significance of the results — all from three photos. No wipes, checkerboards, animations, or other PowerPoint detritus. This is the 21st-century digital projector bashed back into the 20th century. This is one of those carousel slide projectors I’ll only pretend to have seen in person. I’m only projecting still images but here, in the 21st century, I can draw those images from infinite sources from around the globe or my local supermarket. This practice habituates like a hard drug. With a digital projector waiting back in my classroom, I can’t help looking for interesting, relevant images to put in front of my class. A digital projector shrinks the time-gap between my learning moment and theirs. A digital projector has effectively buried the difference between What Fascinates Me and What I Teach. Can I Get That On A Mug? I’m not an expert on education but I can very reliably tell you when I’m bored out of my mind. Tom Woodward, describing his reaction to lecturing, even a lot of the good stuff. Gotta tattoo that somewhere. Never assume anyone but you even cares. Words to live by from Benjamin Baxter, student teacher blogger, whom I linked up earlier today. Damn but it’s the rare ed-blogger who can write the classroom anecdote well. TMAO’s got it. Jackie’s got it. Granted it’s something of a disgraceful genre (cousin to the airport paperback thriller) but I don’t know many bloggers on my reading list who can put me there, who don’t default to the overly-familiar indicators of happiness and frustration. “It can’t be 7:14 a.m.,” I thought to myself. “It’s too light outside.” I re-read the clock, correctly this time. 7:44 a.m.
Stupor over. I threw on yesterday’s shirt, socks and pants, and rushed out the door. I gave her an out. She took it. It’s kinda disappointing once you realize that the excitingest, heart-thumpingest part of your day is realizing you didn’t set your alarm the previous night. Dunno if this month-old blogger’s ready for the big show but he’s worth reading, certainly, and, depending on your tolerance for airport paperback thrillers, a subscription, maybe. He has the right to refuse ill-supported tech; or obtuse tech; or irrelevant tech; or redundant tech; or tech whose outcomes have not been measured sufficiently enough to warrant its judicious use in a classroom by a thoughtful teacher. And let me tell you: blogger and Twitterer and 1:1 lab-er and Goggle Doc-er and Webinar-er and Voicethreader and Skyper and nascent info designer though I may be, I’m beginning to suspect that the ed tech world is rife with the stuff enumerated in [the paragraph quoted here]. I’ve never in my life seen a phrase like “but it’s the 21st century” get more unexamined idolatry. And I scrapped the post.